Voters in the United Kingdom have chosen to leave the European Union by a 52-48 percent margin, making Great Britain the first nation to leave the EU. The turnout was large with over 70 percent of eligible voters going to the polls. The process of doing so will be protracted with complex negotiations likely extending two years or more under Article 50 of the Lisbon Treaty. 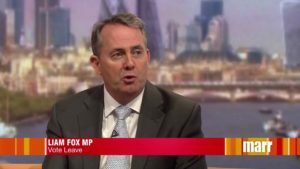 Liam Fox came out early for Brexit. Prime Minister Cameron gambled and lost. The EU began as an attempt to integrate Europe’s financial and business markets and did so with considerable success. Over time, the business model evolved into an attempt at supranational political integration to the point where over half of the UK’s law and regulations emanated from Brussels, not London. The UK voters in essence have voted to unravel that forced political integration. Resentment over that trend, along with concerns that the Europeans had lost control of their borders and therefore their security, coalesced in the UK vote to leave the EU. In the short-term, the vote already is triggering a series of political and financial repercussions. Perhaps the most dramatic is the announcement by Prime Minister David Cameron that he will resign his office, probably in October. The vote also is a blow for President Obama who made no secret of his preference that Britain should remain in the EU, sparking deep resentment in the UK when he expressed those sentiments during a recent visit to London. The irony for Cameron is none of this had to occur. He was under no requirement to hold a referendum at all and did so initially to placate members of his own party, believing the British public would never vote to leave the EU. He gambled, miscalculated and it cost him his job. It also will set his nation on a path he never wanted it to take. The vote will trigger a scramble within what had become a badly divided Conservative Party to select a new party leader. Leading candidates are expected to include former London mayor Boris Johnson and Dr. Liam Fox, a Member of Parliament and former chief of the UK defense forces. Both men have been prominent leaders of the “Leave” campaign. Within the UK, a majority of voters in London — a major financial market — as well as those in Scotland and Northern Ireland voted to remain in the European Union. The result could trigger a move in Scotland, for example, to hold a second referendum, revisiting a decision made by its voters to remain in the UK. It is conceivable such a vote could result in Scotland voting to leave the UK and rejoin the EU but that is far from assured. Financial markets, which were expecting an outcome which would have kept the UK in the EU, reacted initially with alarm. The pound sterling plunged by about 10 percent and global markets were trending downward. Those results are likely to moderate as the international financial community assesses the long-term implications of the vote. The consequences for the Europeans will be no less profound than for those in Great Britain. France and Italy, among other EU members, have sizable numbers of supporters who are chafing under the heavy handed bureaucratic diktats coming from EU headquarters in Brussels. Already Marine Le Pen’s right wing political party in France is calling for a similar referendum to be held there.